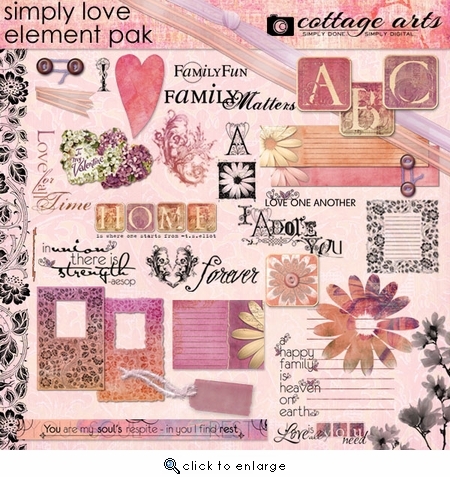 Create intimate, expressive, gorgeous art with this jam packed Element Pak, which coordinates with our Simply Love 1 Paper and Sentiment Paks. Tag, stamps, journaling mats, frames, art nouveau borders and stamps, hand drawn doodles, ribbons, stitching, and 11 artistic word art overlays (each about 6 inches wide at 300 dpi). Also includes a collage type coordinating chipboard AlphaSet: A-Z. BONUS: Printable Alpha Sheets for paper scrappers. Not everything shown on preview.